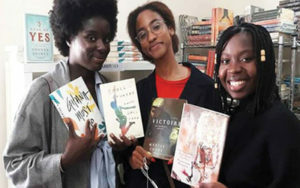 The team at Chez Alpha Books is made up of young African women from different countries. NATIONWIDE (BlackNews.com) — Tourists planning to visit the new Museum of Black Civilization in Dakar, Senegal should also take a moment to check out Chez Alpha Books, an English bookstore committed to writers from The Diaspora, fiction /non-fiction stories related to the history, and experiences of people from The Diaspora along with other world literature. Committed to community engagement and outreach, Chez Alpha Books works hard to coordinate activities that further encourage reading. In 2018, they organized book launches for two new novels that have achieved great acclaim, The Hundred Wells of Salaga by Ayesha Haruna Attah and Fisherman’s Blues by Anna Badkhen. School visits, public readings, discussions with book clubs and radio interviews were just a few events coordinated around these novels. In addition, Chez Alpha Books intends to expand their ability to distribute books to other organizations in Senegal. Client feedback and positive response has been core to the ongoing growth of Chez Alpha Books. Shelves are lined with African classics by Chinua Achebe, Mariama Ba and Cheikh Anta Diop while also displaying works from new writers, along with hard to find novels and fiction/nonfiction books that “decolonize” history and provide an authentic perspective on African civilizations. In her book store, books like African Cosmos, The Blacks of Premodern China and Luta Continua –Introducing Amilcar Cabral to a New Generation of Thinkers intermingle with Frantz Fanon’s Black Skin, White Masks and The Wretched of the Earth. Fiction works of Alain Mbanckou, Vamba Sherif, Laila Lalami, Nadifa Mohamed, Nisi Shawl and Boubacar Boris Diop are also prominently displayed. Chez Alpha Books also feels their role is growing as an agent of intercultural discourse. Senegalese come in requesting Between the World and Me by Ta-Nehisi Coates, titles by James Baldwin, Orientalism by Edward Said or American Marriage by Tayari Jones, while visiting African-Americans arrive looking for books by Aime Cesaire, Amos Tutuola, and Mariama Ba along with stories about Anna Madgigine Jai Kingsley: The African Princess, Florida Slave, and Plantation Owner. The Museum of Black Civilization began as an idea proposed by Leopold Sedar Senghor, Senegal’s first president over 50 years ago, therefore it is only fitting that in the children’s section at Chez Alpha Books there is a beautiful book about his life. The museum is dedicated to “decolonizing African knowledge” and hosts artifacts and exhibitions representative of both continental Africa, and its diaspora. The museum’s first exhibitions showcase works of artists from Mali and Burkina Faso as well as from Cuba and Haiti. The diaspora in Brazil and the United States are also represented in the museum’s collection. Proud of what she has accomplished, Franklin believes that if you visit Dakar for one week or one month, adding Chez Alpha books to your “places to visit list” is a must!